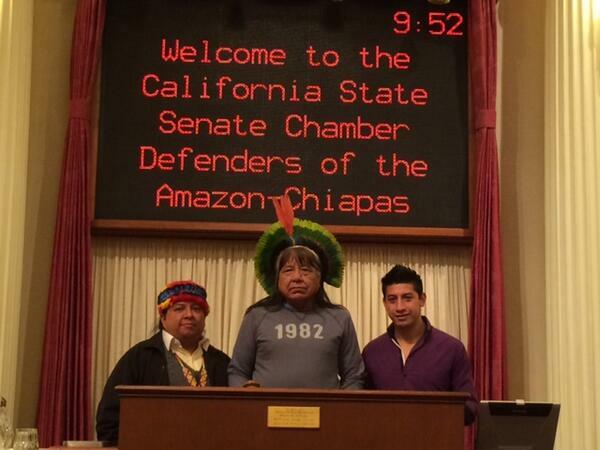 From left to right: Juan Carlos Jintiach, Megaron Txucarramae (a leader of Brazil’s indigenous Kayapo tribe), Lubenay. A recent article in the Journal of Climate predicts that destroying the Amazon rainforest would cause disastrous drought across California and the western United States. Californians are already no strangers to drought – the state is suffering one of its worst on record. But the research adds an interesting dimension to what we already know from numerous studies about deforestation: that greenhouse gas pollution in California and around the world makes forests, including the Amazon, drier and more susceptible to widespread fires. California may be thousands of miles away from “the Earth’s lungs,” but how we treat our diverse ecosystems directly affects the one atmosphere we all share. It is good news for everyone that California’s Global Warming Solutions Act (AB 32) – which includes the world’s most comprehensive carbon market – is already helping reduce the state’s greenhouse gas pollution. Amazon states and nations have also greatly reduced their greenhouse gas emissions from deforestation, which collectively accounts for as much greenhouse gas pollution as all the cars, trucks, and buses in the world. California now has a terrific opportunity to show global environmental leadership by helping Amazon states keep deforestation rates headed for zero while helping save money for companies and consumers in the Golden State. The current world leader in greenhouse gas reductions is Brazil, which has brought Amazon deforestation down about 75% since 2005 and kept almost 3 billion tons of carbon out of the atmosphere. 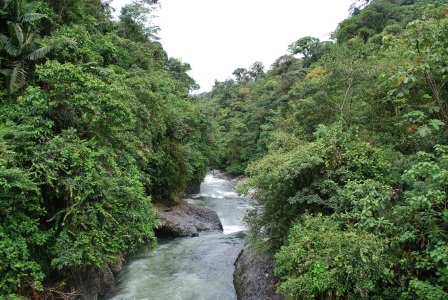 Indigenous peoples and forest communities have played an essential role in this accomplishment. Decades of indigenous peoples’ struggles against corporate miners, loggers, ranchers, and land grabbers and advocacy in defense of their land rights have resulted in the legal protection of 45% of the Amazon basin as indigenous territory and forest reserves – an area more than eight times the size of California. These dedicated indigenous and forest lands hold about half of the forest carbon of the Amazon, and have proven to be effective barriers against frontier expansion and deforestation. In a real sense, indigenous and forest peoples are providing a huge global environmental service, but that service is almost entirely unrecognized, let alone compensated. And in Brazil, where agribusiness is pushing back hard against law enforcement and reserve creation, deforestation is back on the upswing – increasing nearly 30% last year. California has a role to play in keeping Amazon deforestation on the decline and giving indigenous and forest communities the recognition and support they need. A program called Reducing Emissions from Deforestation and Forest Degradation (REDD+) gives countries or states that commit to reducing deforestation below historic levels “credits” they can sell in carbon cap-and-trade markets. Getting these programs recognized by California’s carbon market would send a powerful signal that forests in the Amazon and around the world are worth more alive than dead, and would also provide real incentives for further reductions. 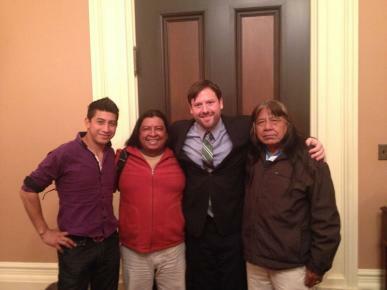 A few weeks ago, indigenous leaders from Brazil, Ecuador, and Mexico are in California engaging state leaders and policymakers on the issues of deforestation, indigenous and local peoples’ rights, and potential partnership with California’s carbon market. California should insist that only jurisdictions that respect indigenous and local peoples’ rights, territory and knowledge, and ensure that they benefit from REDD+ programs get access to its market. The successful adoption and implementation of AB 32 is proof that California is leading the nation on effective, market-based climate change policies. But it’s time to take that another step forward. By allowing credits from REDD+ to play a role in the AB 32 program, the Golden State can be a world leader on one of the most significant causes of climate change and take action to protect the health and prosperity of a threatened land and its people. Does the future of the Amazon rainforest lie in California? By Derek Walker and Steve Schwartzman. Over the past year, California’s new carbon market has held five auctions, generating $530 million for projects that reduce climate pollution in the state. This is just the start, however, as we believe the program has potential to achieve substantial environmental benefits half a world away in the Amazon rainforest. We are working with community partners, scientific and business leaders, and California policy makers to craft a rule that permits credits from REDD (Reducing Emissions from Deforestation and forest Degradation) to be used in California’s carbon market, rewarding indigenous and forest-dwelling communities with incentives for ecosystem protection. From left to right: Lubenay, Juan Carlos Jintiach, Derek Walker and Megaron Txucarramae (a leader of Brazil’s indigenous Kayapo tribe). Using California’s new carbon market to reward rainforest protection would be a powerful signal to Brazil, Mexico, and other tropical countries—and to the world—that leaving forests standing is more profitable than cutting them down. With the right rules in place, California could create an international gold standard for REDD credits that could be adopted by emerging carbon markets in China, Mexico and beyond. There’s a misperception about how hard it is to measure whether forests are being destroyed or protected. Current technology makes it possible, right now. Satellite and airplane-based sensors are already capable of recording what’s going on with high accuracy. This technology enables us to measure emissions reductions across whole states or countries, the best way to ensure that the reductions are real. We need to help pull together the best policy experts, scientists, and environmental organizations to help California government officials write model rules for REDD that can create a race-to-the-top for forest protection around the world. We need to show that trailblazing states – like Acre in Brazil and Chiapas in Mexico – are ready to be partners with California and can deliver the rigorous level of enforcement and program implementation that California requires. There’s real urgency to linking California’s carbon market with REDD. Even though Brazil, home to the world’s largest tracts of tropical forests, has cut deforestation by about 75% from its 1996-2005 levels and consequently become the world leader in reducing greenhouse gas emissions, that progress is fragile. Over the past year, agribusiness has been pushing back hard against law enforcement and the creation of protected reserves, and deforestation increased nearly 30%. If we want Brazil to continue reducing its deforestation towards zero, we must provide economic incentives to protect the Amazon, and California can be an important catalyst in doing that. There is never a dull moment on the California environmental policy scene, and 2013 was particularly action-packed. Everywhere you turn there seems to be a new innovative solution or a fresh example of a company, city, organization, or individual making a profound difference in putting the Golden State on the path to a clean energy future. Environmental Defense Fund (EDF) has the privilege of being in the middle of many of these groundbreaking developments, and in the past 12 months, California has taken a number of exciting steps forward. What follows is our “13 for (20)13” recap of the most consequential stories in the California climate change and energy policy world, in our own words. From celebrating the one-year anniversary of a successful carbon market to forging partnerships with other states and countries to marking continued innovations and opportunities in clean energy and fuels, it has been quite a year. Here’s to an even better 2014. The results of California’s fifth carbon auction were released today, marking an important environmental milestone for the state – one year since the debut of its cap-and-trade system. Last week, we saw a big win for California’s Low Carbon Fuel Standard (LCFS) – a regulation to diversify the state’s fuel mix with lower carbon sources of energy. After almost a year of deliberation, the United States 9th Circuit Court of Appeals filed a decision in the case Rocky Mountain Farmers Union, et al. v. Corey, in favor of California. I’m an L.A. guy, so I like to think about things in epic story lines. And with today’s launch of EDF and UCLA’s Luskin Center for Innovation new “LASER” maps (Los Angeles Solar & Efficiency Report), I think we’ve got a real blockbuster on our hands. A key reason California has become a global leader on climate change is its ability to successfully adopt the Global Warming Solutions Act, the state’s climate law that uses market-based tools to significantly reduce the state’s greenhouse gas emission levels. A group of tropical forest experts has now presented a blueprint for how California can secure significantly more reductions in global warming pollution than the law requires, while keeping pollution control costs down and helping stop the catastrophe of tropical deforestation. Today, the California Air Resources Board (CARB) released its draft 2013 Scoping Plan, the blueprint outlining how the State will address climate change over the next five years, reach its goal of reducing greenhouse gas emissions to 1990 levels by 2020, and create a path for even deeper reductions beyond 2020. Despite some particularly unexplainable losses if you care about protecting the environment, the California Legislature made progress in 2013. The range of bills on the governor’s desk awaiting his signature confirms that California remains the stalwart energy and climate leader in the country. With the stroke of a pen, North American efforts to combat climate change and promote clean energy reached a new level today. The past week has offered a thrilling glimpse into the future for the millions of people around the U.S. and across the world who are yearning for real solutions to climate change. On June 18, Shenzhen, an economically-vibrant city of 15 million on the South China Sea, launched the first of seven Chinese regional pilot carbon market systems slated to begin by the end of 2014. It is well-documented that petroleum refineries release large amount of pollutants that are harmful to the environment and make people sick. In California, these refineries are among the largest sources of carbon dioxide, accounting for 7 of the top 10 sources for climate pollution. According to data from the U.S. Environmental Protection Agency, refineries can also emit large amount of toxic compounds, including carcinogens and respiratory irritants. I was lucky enough to witness the historic event, as Governor Jerry Brown joined the leaders of Oregon, Washington State and the Canadian province of British Columbia, to sign an agreement that formally aligns climate and clean energy policies in the four jurisdictions. This signing by these “Fab Four” of the Pacific Coast Collaborative makes sense given all they have in common: they’re geographically connected, share infrastructure, and their combined regional economy accounts for a $2.8 trillion GDP, making it the world’s fifth largest economy. Beyond the symbolic nature of today’s announcement, the event signals California’s far-reaching influence on energy and climate policy development. Once labeled the “go it alone” state, California is now succeeding with its “lead by example” approach. What has driven this success? Most recently, the Golden State established the world’s most comprehensive cap-and-trade program, a proven and sensible environmental and economic approach to limiting greenhouse gas emissions. Once considered a “grand experiment,” its early success has helped to establish a strong, viable market and spur interest from around the world. Today was no exception, as business, labor and environmental leaders from all four jurisdictions joined the signing, signifying a strong regional commitment to putting a price on carbon, using market mechanisms to spur a clean economy and reduce pollution on a regional scale. The agreement is also further proof that strong climate and clean energy policies are tied to economic benefits, creating a large market for innovators and low-carbon businesses in the region. California is on the brink of linking its cap-and-trade program with Quebec’s; making the two states’ carbon allowances interchangeable and showing growing carbon market momentum. Today’s event is a beacon of hope for national and global action to fight climate change. While the four parties in this agreement are in different stages in putting a price on carbon, their combined commitment is a positive sign and further impetus for regional and international collaboration. The vision of these four leaders – along with California’s proven record of success – makes me very optimistic that we are on the right path. The past week has offered a thrilling glimpse into the future for the millions of people around the U.S. and across the world who are yearning for real solutions to climate change. On June 18, Shenzhen, an economically-vibrant city of 15 million on the South China Sea, launched the first of seven Chinese regional pilot carbon market systems slated to begin by the end of 2014. The Shenzhen market is set include at least 635 local companies that contribute approximately 40% of the city’s CO2 emissions, and is expected to result in a 21% decrease in the carbon intensity of the economy in just two years. Shenzhen is one of seven carbon trading pilots that represent about 25% of China’s GDP and may include thousands of companies emitting hundreds of millions of tons of CO2. Inspiration, encouragement and support for Shenzhen’s maiden market launch came from a familiar place: California. Both Shenzhen and California have well-established reputations as trailblazers on innovative solutions that match economic growth with environmental gains. Perhaps it will be little surprise, then, that none other than the state’s top climate change official, California Air Resources Board (CARB) Chair Mary Nichols and Governor Brown’s personal representative, Wade Crowfoot, stood with senior officials from Shenzhen and from the National Development and Reform Commission (NDRC) at last Tuesday’s launch. 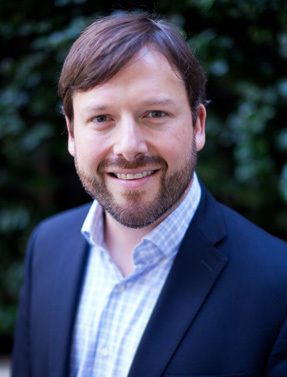 Nichols has presided over the development of California’s groundbreaking climate change effort and oversaw the Fall 2013 launch of California’s carbon market, the first comprehensive state-level system in the U.S. The California market is a promising model for Shenzhen and the other Chinese pilots. California has held three allowance auctions to date, with strong participation by companies and a modest increase in the price of allowances with each auction. Ultimately, California’s carbon market will be a key element driving the state back to 1990 levels of greenhouse gas pollution by 2020, accompanied by dramatic improvements in air quality and significant incentives to carbon-cutting entrepreneurs. Nichols formalized the partnership between California and Shenzhen by signing a Memorandum of Understanding (MOU) paving the way for technical cooperation between officials and other stakeholders engaged in the respective carbon market programs. The California-Shenzhen partnership is just the tip of the iceberg in the crescendo of cooperation between the U.S. and China. Earlier this month in California, President Obama and Chinese President Xi signed an agreement to collectively fight dangerous hydrofluorocarbons (HFCs) that are used in air conditioning and refrigeration. HFCs are pound-for-pound some the most potent greenhouse gases, and controlling them will be an essential short-term piece of solving the climate change puzzle. The Chinese carbon trading pilots are strong signals that climate change is an issue to be taken seriously and to be acted on expeditiously. In the U.S., President Barack Obama takes the stage in Washington tomorrow to lay out his Administration’s vision for bold national action to fight climate change, an eagerly-anticipated outline of how progress will be achieved towards Obama’s 2009 commitment to slash greenhouse gas pollution 17% by 2020. While 2020 will be an important milestone in charting progress, it is but the beginning of a long journey. Climate change science couldn’t be clearer about the need to achieve dramatic greenhouse gas reductions by mid-century. And no long-term solution to the environmental challenge of our lifetime will be found without the leadership of the world’s top greenhouse gas polluters. That leadership is now coalescing into national and bilateral action and, for the first time in some time, offers hope that we are headed in the right direction. 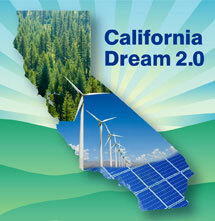 2012 was an exciting year for California’s climate change and energy leadership. Our “Top 10 Blogs of 2012” recap some of the year’s highlights and illustrate how EDF is engaged in groundbreaking work in the Golden State every day. Whether it was helping to pave the way for the opening of North America’s largest carbon market in California, or helping design the first commercial On-Bill Repayment program, EDF was at the center of the most important environmental issues facing California in 2012. In 2013, we will continue to tout both the economic and environmental benefits of California’s landmark environmental programs. California is our nation’s most important laboratory for meaningful action on climate change and clean energy. We must ensure that California serves as a model for the nation proving that good environmental policy can create jobs, spur our economy, and improve our overall quality of life. We look forward to a productive and prosperous 2013 and will continue to share with you the stories that impact California and shape our nation.